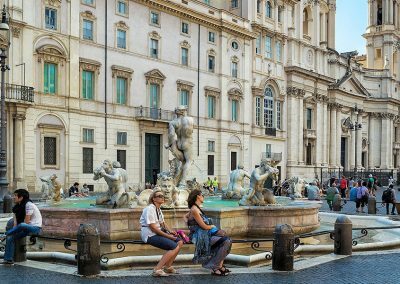 There can be no doubt that the area between the Pantheon and Piazza Navona is one of the most picturesque areas in Rome. 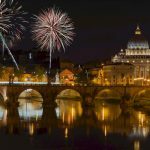 Masterpieces of art are disseminated at every corner across the district, evidence of the fact that Rome is for real an open-air museum! 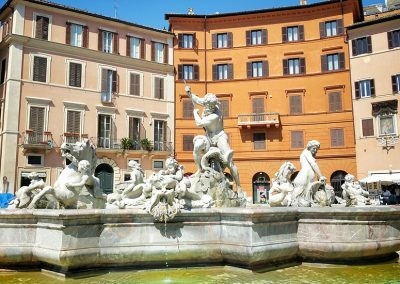 Not only this area covers some of the most important artwork in Rome such as Bernini’s Fountain of the Four Rivers, and the Pantheon of course, but it also hosts the local Market of Campo De’ Fiori, local boutiques, tasty bakeries and typical trattorias. 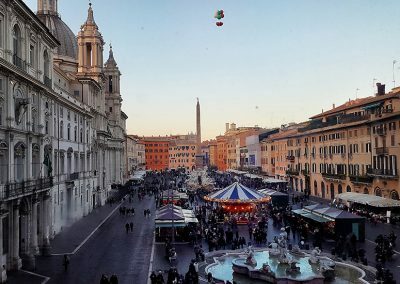 Navona Square and Pantheon Area is for those travelers who know how to discover and appreciate a city from many points of view, ranging from masterpieces of art to food delicacies, from museums to local cafes, from shopping in local stores to enjoying a gelato break. 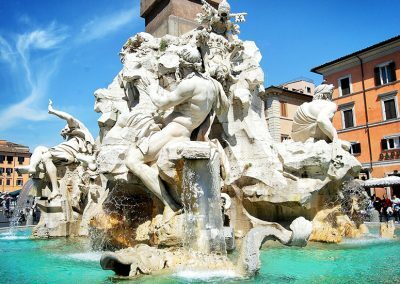 Hence, start discovering this amazing area right from Piazza Navona, one of most loved squares in Rome. 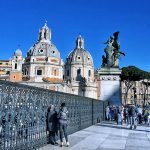 In Rome nothing is exactly as it looks like, and in Piazza Navona you will discover you are standing right on the remains of Domitian Stadium. 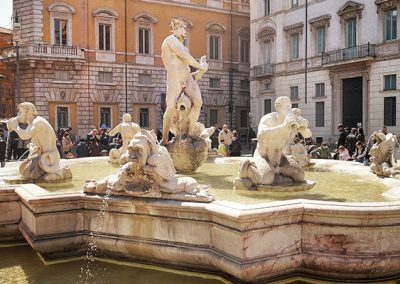 Main work of the piazza is Bernini’s Fountain of the Four Rivers, sided by the Neptune Fountain and The Fountain of the Moor. 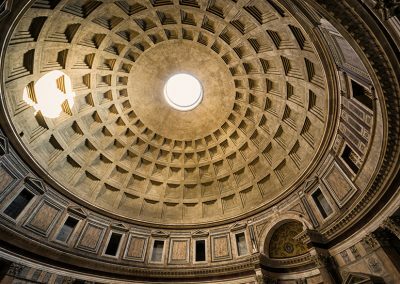 The Pantheon, located in Piazza della Rotonda, is known for being the best preserved monuments from the Ancient Rome. With its imposing structure, this ancient temple stun visitors from all over the world. 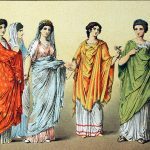 An guess what? 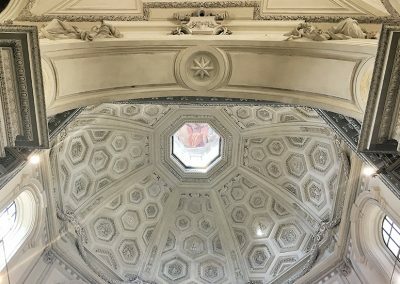 Entrance is free, since the monument has been turned into a church. 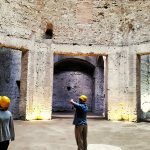 So don’t be shy and go inside to admire the true masterpiece of this landmark, the gigantic dome characterized by a big hole known as “oculus”! 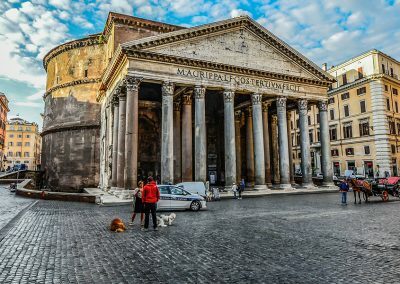 Don’t walk too far from the Pantheon. 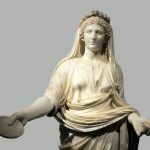 On the left side of the monument stands another masterpiece. 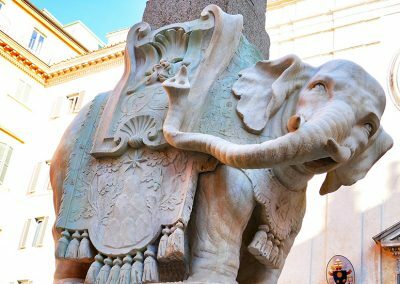 In Piazza Della Minerva rises a really unique statue know as The Elephant and The Obelisk, work of Bernini’s genius. 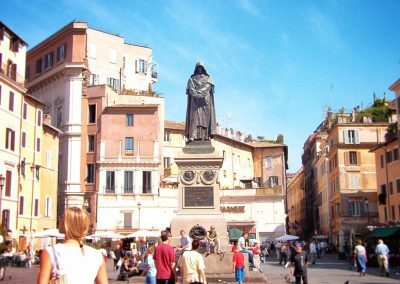 If you feel like getting to know the real Rome, then head to Campo de Fiori Market surrounded by steep, charming alleys. 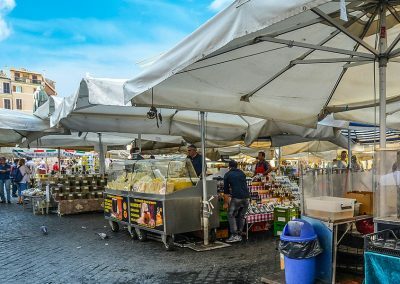 Stroll around the stalls selling all kinds of food, such as cheese, cured meats, pasta, vegetables, fruits and more than you can imagine! 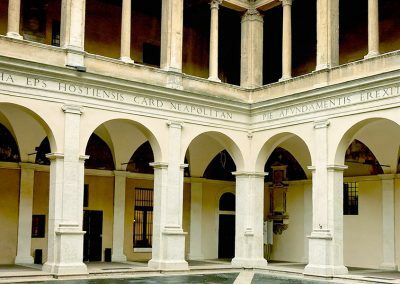 And if you are looking to get some rest from the bustle and hustle of the city, you’ll just have to walk a little bit more till Bramante’s Cloister. The Cafeteria is an oasis of peace and has a great selection of pastries!